I think I’ve outdone myself. 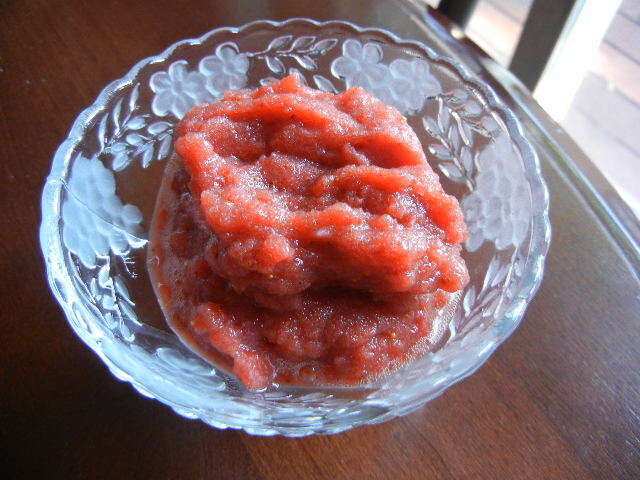 I made sorbet last season. It was my first time, and I didn’t have an ice cream attachment for the kitchen aid mixer. Heck, I didn’t even have a kitchen aid mixer last season. I love lemons and I love limes. I especially love the mint that grows at HighCross Farm. Put all three together and you get something that is completely sublime. I love the flecks of mint and zest in the sorbet. You should be warned, this recipe calls for the use of raw beaten egg whites. They are crucial. Trust me when I tell you they give the sorbet a wonderfully creamy texture. In a medium sauce pan add the water and sugar. Heat to boiling, stirring occasionally. Once the mixture gets to boiling, take off the heat and let cool to room temperature. In a blender or food processor, chop the zest and the mint. Set aside. In a large bowl, add the simple syrup, lemon/lime juice and zest/mint mixture. Stir. You might want to pour the juice into the syrup in batches and taste before you add more. I say this because some people like their sorbet on the sweet side, some on the sour. Myself, I prefer mine on the sour side. Ok, if you do not have an ice cream maker you can put in the freezer. Stir with a wisk every thiry mins for a couple of hours to incorporate some air. Add the beaten egg whites at your last stir. Let freeze over night. If you have an ice cream maker, chill the mixture over night. Once thoroghly chilled, churn in your ice cream maker using instructions for whichever ice cream maker you have. During the last 10-15 of churing, add the beaten egg whites. Transfer to a container and let freeze for at least 8 hours.